Suffolk County Crime Stoppers and Suffolk County Police Fourth Squad detectives are seeking the public’s assistance in identifying and locating two individuals who stole sunglasses from a Lake Grove store last month. Lake Grove, NY - April 22nd, 2015 - Suffolk County Crime Stoppers and Suffolk County Police Fourth Squad detectives are seeking the public’s assistance in identifying and locating two individuals who stole sunglasses from a Lake Grove store last month. 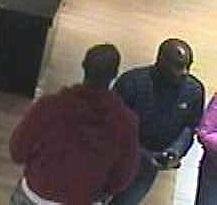 On March 21, 2015 at approximately 1 p.m. a man and a woman entered Solstice Sunglasses, located at 200 Smith Haven Mall in Lake Grove, and stole five Christian Dior sunglasses worth approximately $1800. The man is described as a black male with a shaved head who was wearing a dark-colored jacket. The woman is described as a black female who was wearing a pink coat a pink hat and was carrying a large pocketbook. Subject: LongIsland.com - Your Name sent you Article details of "Duo Wanted for Stealing $1.8k in Designer Sunglasses from Smith Haven Mall"